We have already emphasized that the best eulogies are personal ones. They include loving memories of the person’s life. It’s nice when eulogies capture the decedent’s personality. If the person who passed away was kind, the eulogy would give examples of this kindness. 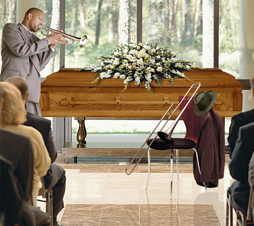 If the decedent had a good sense of humor, the eulogy might relate funny stories or expressions. The eulogy doesn’t have to cover every aspect of their life. In fact, often the best eulogies are those that focus on the giver’s personal thoughts and memories. Do try to acknowledge those who were closest to the decedent as well as important achievements in the person’s life, but don’t feel obligated to create an exhaustive biography. Keep in mind that the word eulogy comes from the Greek eulogia, meaning praise or blessing. This is the time to give thanks for a person’s life and to honor his or her memory. This is not the time to bring up painful or difficult memories but to emphasize the good we can find in all people. Writing and delivering a eulogy is a loving, important gesture that merits your time and attention. Though the task may seem daunting right now, you’ll find that once you start jotting down ideas, it will come together naturally. Afterwards, many who attend the funeral will thank you for your contribution, and your eulogy will be cherished always by family and friends. Think. Before you start writing, go for a long walk or drive and think about the decedent’s life. This will help you collect your thoughts and focus on writing the eulogy. Write a draft. Once you’ve brainstormed and collected memories, it’s time to write the first draft. Go somewhere quiet and write it all in one sitting, start to finish. Don’t try to get it perfect now-just get it down on paper. Present your eulogy with love. Now you need to present your eulogy. If you are nervous, try to keep your focus on a family member or friend that you are comfortable with. If you break down as you’re talking, that’s OK. Everyone will understand. Just stop for a few seconds, collect yourself and continue.